There is a certain thrill factor, one which transports you back to the days of speakeasies, as you enter the 606 Club. A barred gate stands before you, accompanied by a door-bell. On pressing the bell, you are admitted access and descend the stairs into the below-ground belly of the club. This ritual of old was an appropriate way to begin last night’s event - Walter Smith III’s album launch. TWIO is characterised by the same fun and slightly nostalgic atmosphere as that which the door-bell conjures up. 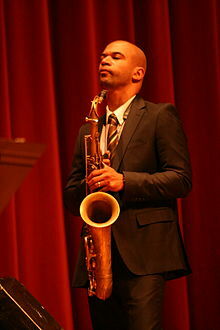 Walter Smith III is a big name in international jazz circles, for a good reason. His craftsmanship of improvised melody, agility and real sense of spirit are evident in both his new album and his performance. The album itself features double bassist Harish Raghavan and Drummer Eric Harland as well as including guest appearances from Christian McBride on bass Joshua Redman on tenor saxophone. The record is a feat of musicality and achieves real freshness, despite the obvious influence of many names in the jazz canon. It is already being talked about as a candidate for major annual awards. It is a joyful piece of work; a feeling which so clearly carried through to last night’s launch. Walter Smith III partnered with bassist Michael Janisch and Drummer Andrew Bain for the 606 performance. These two accomplished musicians did a fine job filling the shoes of the original trio members. Both the album and performance made great use of the instruments - with textural variety, rhythmic interest and subtle yet exciting interaction. It would be easy for this non-chordal instrumentation to be dull or for the saxophone to overpower the others, yet this is consistently avoided by Walter Smith III. Instead, the players are self-controlled, encouraging a tighter sound. Each member of the group was attentive, conceiving tunes which had clear direction and yet space for relaxed solos. Michael Janisch on bass was an especially welcome addition for the evening, bringing exceptional technical skill and energy. Walter Smith III himself played with a characteristic and delightful sensitivity. The two special guest saxophonists invited on-stage last night, Alex Garnett and Zhenya Strigalev eschewed this elegant delicacy, and brought more aggression to the proceedings. ‘There is something different about playing other people’s music. It is music which we have all played for years and it feels so comfortable’, said Walter Smith III, in reference to the pieces featured in the album launch. The familiar sounds of those such as Monk and Wayne Shorter were indeed clearly comfortable for the trio, giving them license to enjoy themselves - a contagious condition for the audience. This is where the Trio finds its strength; an ability to recreate the fervour of the jazz masters in a modern, seemingly effortless and definitely more-ish (!) way.